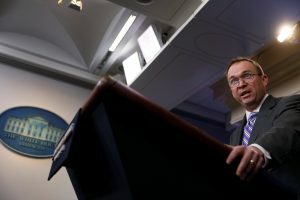 White House budget chief Mick Mulvaney says he doesn’t trust the Congressional Budget Office’s prediction that 14 million Americans will lose health care insurance in the next year under the Republican plan. In interviews Tuesday on MSNBC and Fox News “Fox & Friends,” Mulvaney noted that the CBO was wrong in estimating coverage under former President Barack Obama’s plan. Mulvaney said the office is wrong now too. The findings from the nonpartisan Congressional Budget Office could make prospects for the legislation backed by President Donald Trump even tougher, with a few House and Senate conservatives already in open revolt and moderate Republicans queasy about big cuts to the Medicaid safety net for the poor. Critics of GOP health care legislation have gotten fresh ammunition from a report that says the bill would increase the ranks of the uninsured by 14 million people next year alone, and 24 million over a decade. PBS NewsHour’s Judy Woodruff talks with Amy Walter of The Cook Political Report and Tamara Keith of NPR about the difficulties of selling the American Health Care Act. New York Governor Andrew Cuomo, a Democrat, says the Republican health care plan could be “devastating” to state budgets. Cuomo told MSNBC on Tuesday that he is concerned about the plan to dramatically reduce Medicaid funding. CBO says the plan would reduce budget deficits by $337 billion over a decade. The largest savings would come from reductions for Medicaid, the federal-state health care program for low-income Americans, and elimination of Obama’s subsidies for individuals buying coverage. But the bill’s supporters at the White House and Capitol Hill show no sign of retreat. Instead, they are attacking the parts of the CBO report they didn’t like while touting the more favorable findings, including smaller deficits from their bill and lower premiums over time. Left: White House Office of Management and Budget (OMB) Director Mick Mulvaney speaks with reporters during a daily press briefing Feb. 27 at the White House in Washington, D.C. Photo by REUTERS/Jonathan Ernst.